There's no place like home for the holidays! 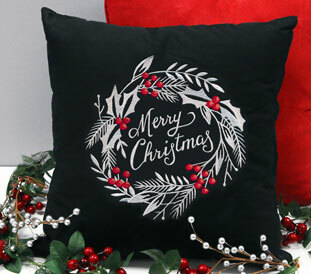 Give your house a festive update with pillows, wall hangings, table linens, and more adorned with elegant Christmas designs. Jaw-dropping frosty foliage, gold-dipped poinsettias, and Christmas candlewicking designs will earn oohs and aahs from any holiday guest. 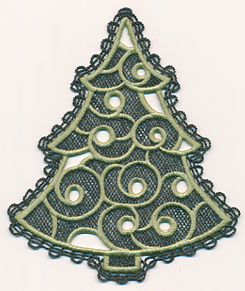 Adorn gifts with elegant in-the-hoop gift tags, and trim your tree with two-tone freestanding lace. Order these breathtaking designs today! 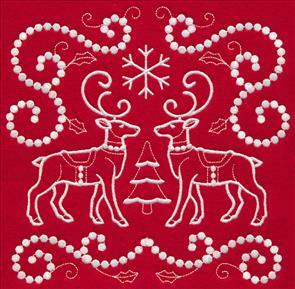 Bring the beauty of the season to your home with new holiday designs! 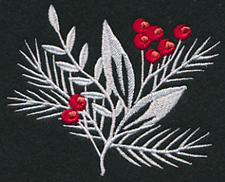 Stunning white winter foliage is striking in contrast with the bold, red berries in this Christmas design. 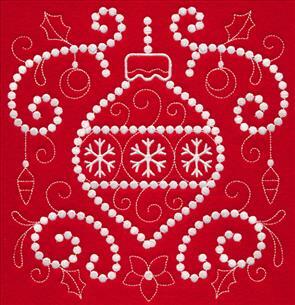 Add to quilts, placemats, and wall hangings to decorate for the holidays. 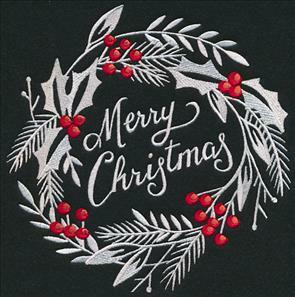 10.37" x 6.88" and 8.82" x 5.85" and 7.80" x 5.18" and 6.87" x 4.56"
Wreaths featuring classic holiday greetings are perfect for adding to pillows and framed art. Pick your favorite saying to welcome Christmas into your home! 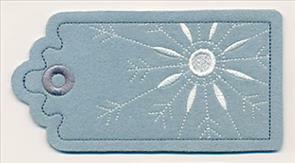 7.78" x 7.79" and 6.89" x 6.90"
A coordinating border adds sophisticated style to any project! 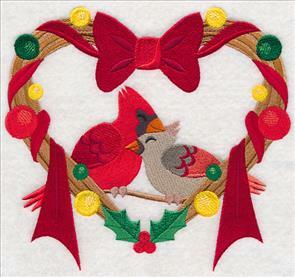 Use in conjunction with the designs above, or stitch on its own on table linens and dish towels. 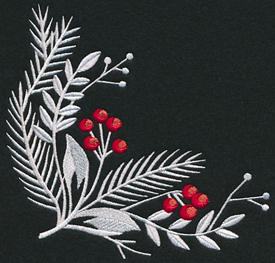 11.75" x 3.32" and 9.40" x 2.66" and 7.80" x 2.21" and 6.00" x 1.94"
The frosty foliage in this corner and single spray make a beautiful impact against black fabric as shown here, or stitch on white for a tone-on-tone look. 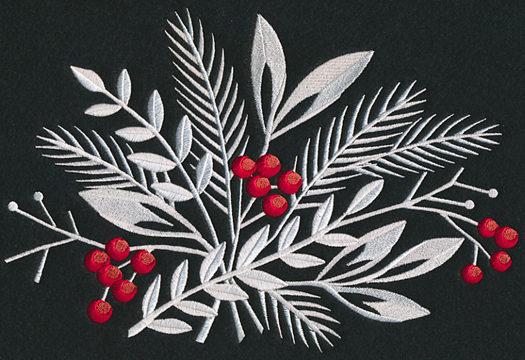 Any holiday home decor will get a sophisticated update when adorned with these whitework designs. Get them all now in a design pack for an excellent price! 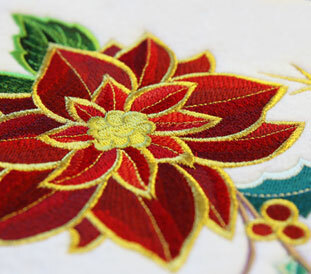 Metallic gold thread gives these poinsettias a magnificent, gilded look. 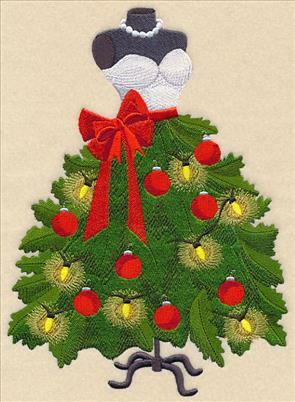 An elegant addition to tree skirts, stockings, wall hangings, and more. 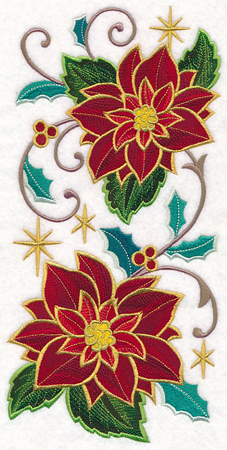 5.67" x 11.74" and 4.55" x 9.41"
Metallic thread adds a hint of glitz and glam to embroidery, but can be a little tricky to work with. Avoid nesting, knotting, or thread breaks with our top tips and tricks. 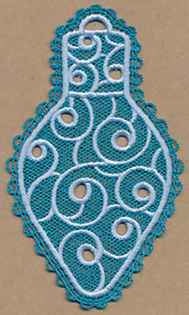 For more information on stitching with metallic thread, find our helpful tutorial and video here. 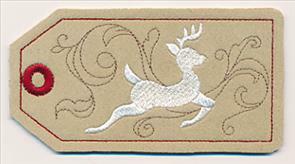 Stitch this gorgeous border with the designs above on a quilt or set or table linens. It's a jaw-dropping addition to any project. 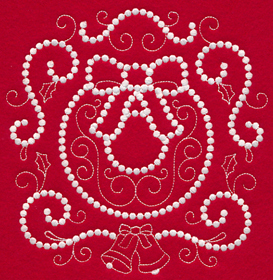 11.74" x 4.30" and 9.41" x 3.45" and 7.81" x 2.86" and 6.86" x 2.52"
Candlewicking was originally a type of embroidery that used thick cotton thread and elaborate knots to add texture. 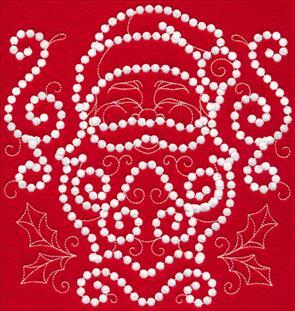 Create the look on your next project with these show-stopping Christmas designs. 7.46" x 7.76" and 6.60" x 6.88"
5.62" x 5.86" and 4.64" x 4.86"
7.54" x 7.85" and 6.90" x 7.17"
5.85" x 6.08" and 4.88" x 5.08"
Today's machine's can't accommodate the heavy cotton thread from hand embroidered candlewicking, but you can easily echo the style in your machine embroidery. 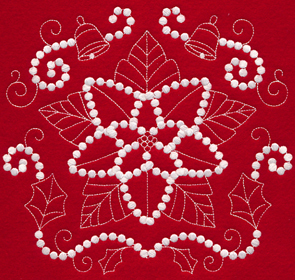 Learn more about candlewicking (including helpful hints for stitching!) with this project tutorial and fun video. 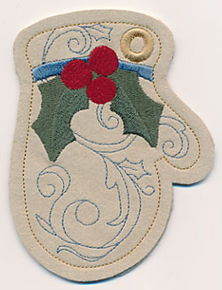 The use of 30 weight cotton thread and smooth, satin stitch dots gives these classic holiday elements the unique look found in candlewicking. 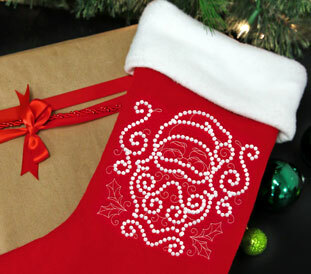 Add them to stockings, aprons, and pillows. 7.78" x 7.58" and 7.06" x 6.87"
6.04" x 5.87" and 5.05" x 4.89"
7.82" x 7.58" and 7.08" x 6.87"
5.99" x 5.85" and 4.97" x 4.85"
Stitch all six of the candlewicking designs on a quilt, or a series of kitchen towels. 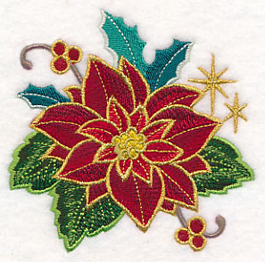 They're a beautiful way to stitch for the season. 7.81" x 7.17" and 7.10" x 6.49"
6.35" x 5.86" and 4.85" x 4.47"
7.67" x 7.83" and 6.85" x 6.98"
5.85" x 5.95" and 4.82" x 4.89"
The bold white of these candlewicking designs will create a breathtaking look on any holiday project. Get them all now in a design pack. 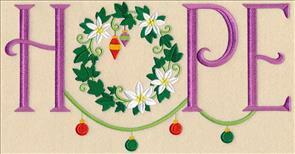 Holiday wreaths make up the 'o' in classic Christmas words, such as Love, Joy, Hope, and Noel. Perfect for bolster pillows and wall hangings! 11.74" x 5.63" and 9.39" x 4.51"
11.74" x 6.59" and 9.39" x 5.27"
7.79" x 4.38" and 6.86" x 3.85"
Stitch all four in coordinating colors, or pick your favorite to use on its own. 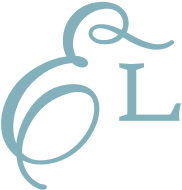 The matching fonts and styles of the word make them beautiful stitched together. 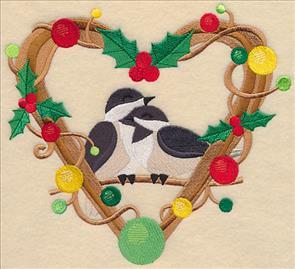 11.75" x 6.14" and 9.39" x 4.89"
11.74" x 5.79" and 9.39" x 4.63"
7.79" x 3.85" and 6.86" x 3.39"
Cuddling winter birds (cardinals and chickadees!) snuggle up in this pair of love nests. 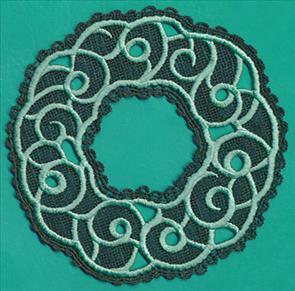 Add to a pair of matching pillows, or use to adorn wall art. 7.50" x 6.87" and 6.38" x 5.85"
7.57" x 6.87" and 6.44" x 5.85"
5.32" x 4.83" and 3.89" x 3.53"
Any fashionista knows that these stylish designs are chic additions to pillows, tote bags, and more. Great for wardrobes and crafts rooms, too! 6.88" x 9.58" and 5.85" x 8.14"
6.86" x 11.74" and 5.49" x 9.40"
4.45" x 7.62" and 4.01" x 6.87"
Two kinds of thread give this lace extra dimension and eye-catching style. 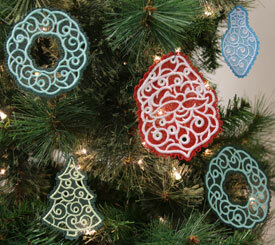 Add these lace designs to your Christmas tree, slip in a holiday card, or use to decorate your home. 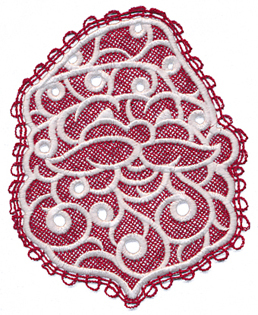 Get more information on stitching these two-tone lace designs right here. 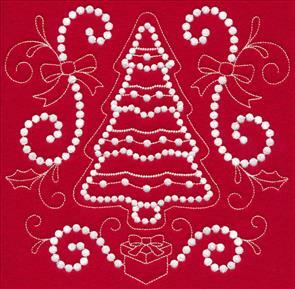 5.81" x 5.79" and 4.82" x 4.80" and 3.89" x 3.87"
3.67" x 5.98" and 3.06" x 4.98" and 2.38" x 3.88"
Decorate Christmas presents with elegant in-the-hoop gift tags. 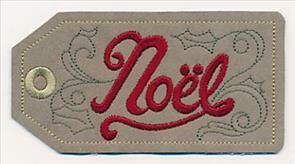 Made from UltraSuede and adorned with beautiful embroidery, these tags are a fabulous way to add festive flair to any present. 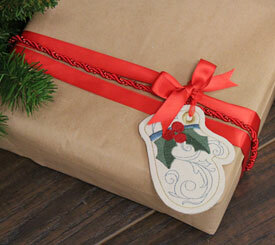 See how to make these in-the-hoop gift tags in this project tutorial. 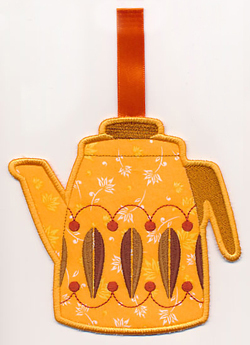 5.00" x 2.57" and 3.85" x 1.98"
5.00" x 2.59" and 3.85" x 1.99"
Annitta was wondering if we could create a towel topper design in a coffee theme, as many decorate their kitchens with the popular hot drink. 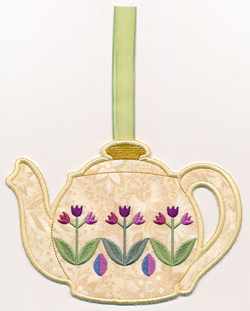 A second variation featuring tea (and matching borders!) were also created. Thanks for the suggestion, Annitta! 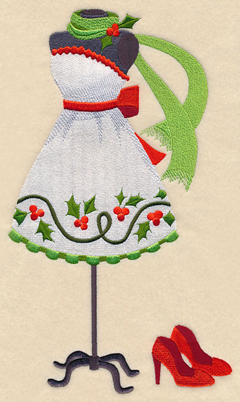 For information on creating in-the-hoop towel toppers, click here. 11.01" x 4.31" and 9.41" x 3.68"
7.81" x 3.05" and 5.97" x 2.33"
11.00" x 3.55" and 9.41" x 3.03"
7.78" x 2.50" and 5.96" x 1.91"